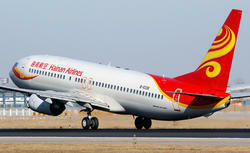 Hainan Airlines has announced a special fare from Seattle to Beijing or Shanghai for only US$411 each way including all taxes and fees, based on roundtrip weekday travel. Special fares are also available to dozens of other cities in China. One free stopover is permitted at Beijing when traveling beyond. What a great opportunity to explore the wonders of China – past, present, and future! Climb the Great Wall, shop for bargains in Beijing, explore cosmopolitan Shanghai, see the famous terracotta warriors in Xi’an, or golf and relax on Hainan Island, the “Chinese Hawaii." Special sale fares are also available from other cities in the United States and Canada, in conjunction with airline partners. Weekend travel is US$100 higher roundtrip. Travel must commence begin between December 27, 2010 and April 29, 2011, with tickets issued at least 7 days in advance. Minimum stay is six days, maximum six months. Some restrictions apply and seats are limited at this fare. Don’t wait! This is YOUR opportunity to see the wonder that is China. Hainan Airlines’ Airbus A330-200 have comfortable seats with individual monitors offering a selection of videos and music on demand; complimentary beverages; a choice of cuisine; and attentive, smiling bilingual flight attendants. Flights depart Seattle every Monday, Wednesday, Friday, and Saturday at 1:40 pm.